Steven Dunston is a musician, author, web developer and a big fan of open source software (just like us!). Back in 2006 he released two albums on Jamendo and now hopes to bring us more of his melodic songs this year. “To Get Home before Night Comes” is an extremely well written & produced album that’s just easy and relaxing to listen to. Steven’s clear, soft and soothing voice makes it feel like the lyrics just flow directly into your ears. It’s hard to tell which of Steven’s albums on Jamendo came first. 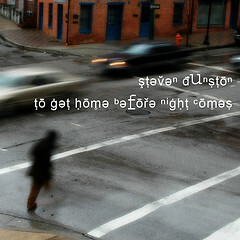 “To Get Home before Night Comes” is an electronic & “easy-listening” release with some touches of pop, ambient and even jazz. I see it as a great companion for lonely drives from work or autumn walks with your dog. It has this very groovy, safe feeling to it that I just can’t get out of my mind. “Danger Girl”, the first track of the album, was the most memorable to me – probably because of the lyrics, but “Alone in the Room” gave me a nice trip-hoppy surprise I was waiting for throughout the album. Give it a try.